Baby wipes. What would parents do without them? With an average of ten diaper changes per day for six months, and all the dirty activities in between changes, it’s estimated that the average parent uses well over 1,000 baby wipes a month. That’s not even including when your baby really decides to let things go. With this in mind, you’re going to want a baby wipe that can perform, that’s highly durable and gives you everything you’d expect without having to think about it. What’s more, these wipes are going on your baby’s skin, so you’re going to want a soft, comfortable and protective wipe that isn’t going to cause any damage. Without any further ado, let’s get on to discover some of my all-time favorite baby wipes that give you everything you could need including quality, performance and, most importantly, puts your baby’s well-being first. Can I Purchase Scented Wipes? Why Can’t I Just Buy Store Brand Baby Wipes? Where Can I Put My Wipes When I’m Done? 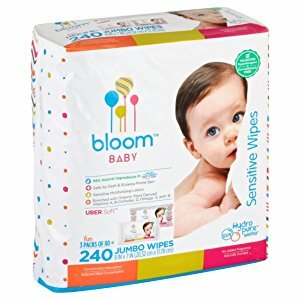 To start my list of favorites, I had to choose the bloom BABY Baby Wipes. These wipes are created to be outstanding at every turn. Crafted into each wipe, you’ll find a selection of plant-based vitamins, such as A, B-Complex and D that helps to nourish and moisturize your child’s skin with every wipe. Thanks to this leading craftsmanship, this recipe ensures that these wipes are soft and delicate on your child’s skin. This makes them ideal for babies with any types of skin, including those suffering from skin conditions such as eczema, sensitive skin or babies who are prone to getting rashes. What's Great About It: Thanks to this expertly designed wipe, you can enjoy the added benefits of no alcohol, parabens, ammonium, lanolin, and SLS, ensuring your baby’s well-being is always put first. 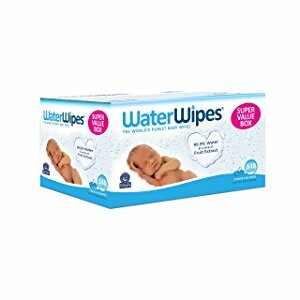 If you are looking for award-winning baby wipes that give you everything you need and more, there is no need to look further that WaterWipes. With these unique and versatile wipes, you’ll be able to enjoy a wipe that only contains 99.9% purified water with 0.1% being natural fruit extract. That means your baby is only coming into contact with completely natural and purified ingredients which will allow you to minimize the risk of certain problems and conditions such as eczema, rashes or other issues that are usually associated with sensitive skin. What's Great About It: Thanks to the pure and diverse nature of these products, you’ll be able to use them for anything. This includes cleaning your baby's bum, hands, face, for cleaning when they’re teething, and they’re even suitable for use on adults or as part of an elderly skin care routine. This brand of baby wipes surprised me as well. Amazon making baby wipes? However, they’re actually one of the leading and most popular branded baby wipes on the market. With each affordable purchase, you’ll be treated to over 720 unscented wipes as well as a handy and convenient storage tub, ensuring you’ll always have wipes with you whenever you need them most. These wipes put your baby’s health first since they contain no added fragrances, parabens, dyes, Bronopol, alcohol or any other potentially harmful chemicals that are traditionally found in some branded or cheap baby wipes. Amazon created these wipes after reading reviews from customers stating they couldn’t find a good baby wipe, so they decided to make their own based on these reviews. This is the final product, and it certainly meets the standards. What's Great About It: In addition to the pharmaceutical-grade purified water that goes into making these wipes, there’s also all-natural Aloe Vera, designed to soothe your baby’s skin as well as added vitamin E, which will moisturize your baby’s skin and lock in hydration. 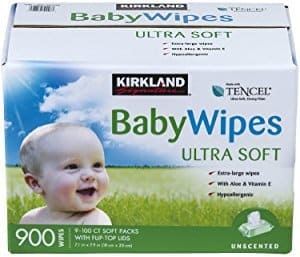 To conclude my list of favorite wet wipes, I’ve chosen the signature baby wipe line from Kirkland, one of the most popular baby wipe brands in the US. These wipes excel in cleansing and nourishing your baby’s skin in the gentlest way possible. This is all thanks to the balanced PH level of each wipe, providing you and your baby with an ultimate soft surface, no matter what purpose you’re using them for. Furthermore, these wipes are completely free from gluten, traces of nuts and any kind of animal ingredients, ensuring that they’re ideal for any babies who have any kind allergy. What's Great About It: These hypoallergenic baby wipes also contain added Aloe Vera and vitamin E, ensuring that your baby’s skin is nourished, giving you the best baby wipe experience. With all this in mind, it’s time to choose the best wipes for you. As you can see, it’s a very competitive market, so it’s important for your baby that you make the right choice. To give you everything you need, follow my step-by-step buying guide below that enables you to make the best purchasing decision. It’s completely up to you whether you want scented or unscented wipes. 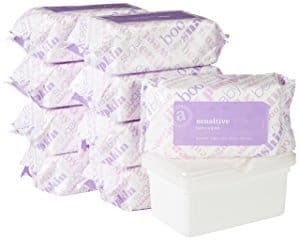 However, you should always test these wipes first before buying a bulk pack as the fragrance and scent used in these wipes can sometimes cause rashes or can irritate babies with sensitive skin. You may also want to check that the fragrance in your chosen wipes isn’t too heavy, as to cause irritation and frustration to both you and your baby. If any of these aspects set alarm bells ringing, it’s always safer to opt for unscented wipes to save this being an issue altogether. In truth, nothing is stopping you from buying branded, and supermarket branded baby wipes. True, they will be more affordable. However, this relates to that fact that these wipes can be cheaply made and may contain extremely cheap materials. If you’re paying $5 for 200 wipes, that’s $0.025 per wipe. Once you take into consideration transport, staffing and production costs, it really makes you think what kind of materials actually go into making these wipes. As a result, these generic wipes may be ineffective. Typically, they are far too thin to carry out any kind of job properly, and are prone to breaking and splitting apart when you really need them to stay together. This means you’re using at least twice as many wipes per job and that basically takes away any savings that you would have made. What’s more, these wipes tend to have a weird slippery texture which hinders progress when trying to clean your baby, and the wipes themselves don’t tend to hold their moisture. This means the bottom of the packet usually collects moisture while the top of the packet is dry, creating a rough surface which can cause friction and rashes when trying to clean your baby. Typically, this will depend on the brand and the type of wipe you buy. If your chosen baby wipes are particularly thick, you won’t want to put them down your toilet, especially if you’re using so many a day. This will also depend on your toilet system that you have in your house. When you first get the wipes, try using 3 to 4 and flush them down the toilet. Stand and watch the process happen and if you feel like the toilet system may block, simply invest in a special diaper bin that can hold in the smell of the wipes, enabling you to dispose of them safely and securely, without having to call a plumber. When choosing what baby wipes are right for you, take your time in finding the perfect product for both you and your baby. You may have to try a couple of brands before you find one that’s right for you, but it’s well worth experimenting. Find the right ones, and you and your baby won’t have to worry about the traditional stresses of cleaning up, allowing you to spend more time focusing on the more important moments in life.